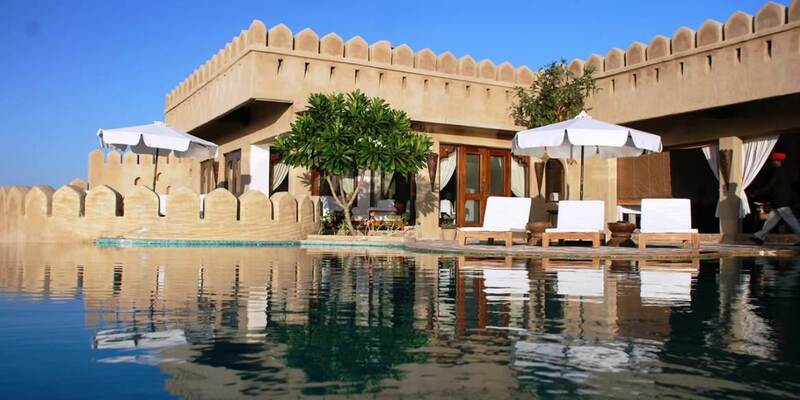 Standing majestically on a sand mound in the midst of the Thar Desert; Mihir Garh, means Fortress of the Sun, a name which aptly describes this boutique hotel, built in the style of a Rajasthan fort it seems to emerge from the desert. 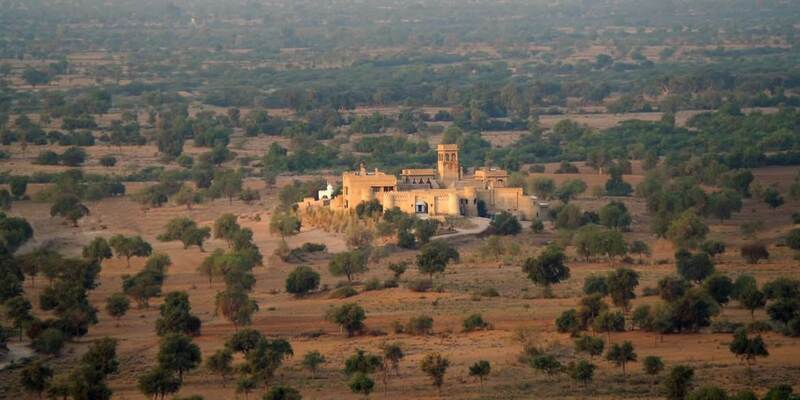 With 360° views over the surrounding countryside the hotel is a scenic one hour drive from Jodhpur, about 60 kilometres away. 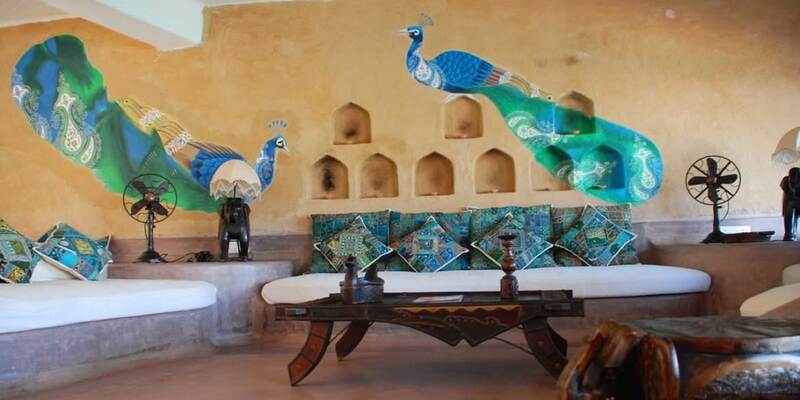 Dining at Mihir Garh is a delectable experience with so many beautiful locations in which to enjoy the cuisine which ranges from the traditional to continental; something to tempt every palate. Choose from the dining room, airy in summer and cosy in winter or perhaps one of the inner courtyards or a roof terrace for an intimate romantic dinner under the stars. Awake to the sound of the birds and the sight of the sunrise and be taken to a secluded spot in the wilderness where a lavish al fresco breakfast feast awaits complete with bread still warm from the bakery; a divine way to start the morning. Partake in a Royal picnic, reminiscent of times gone by, with courteous attendants, live music and delicious food laid on crisp white linens in the surroundings of an ornate tent, all combining to create a memory that will be cherished for ever. 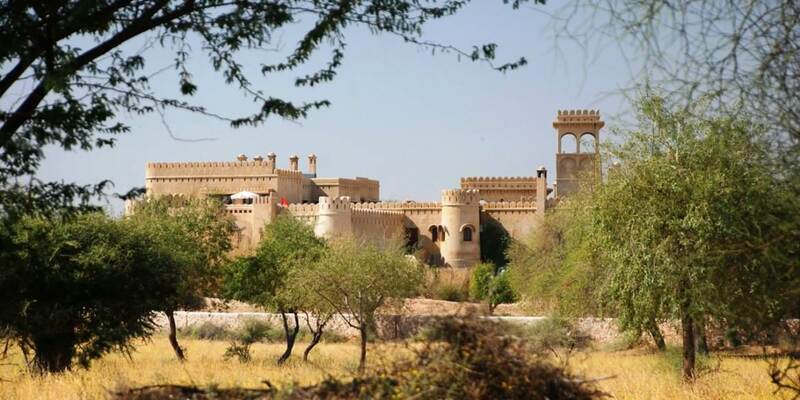 There is a plethora of activities to be enjoyed at Mihir Garh with the Village Safari being one of the highlights which enables guests to experience the real rural Rajasthan. Visit the people of the local village in their mud houses, see the men clad in their turbans and the shy women in their traditional dress. Go to the market, rich with local wares and share in the vibrant local culture and heritage. 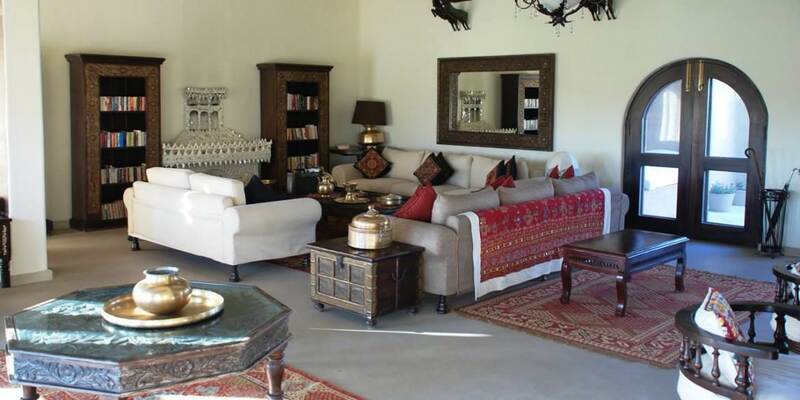 Mihir Garh is also a delight for equestrian lovers and offers guests the opportunity to ride the magnificent Marwari horses. Itineraries are tailor made to suit the individual but include riding across the wilderness seeing a variety of wildlife and birds while enjoying the rich culture of the land, whether on an all-day ride or just for sunrise or sunset .Keen riders will enjoy the extensive three or four day rides which include overnight stays in mobile camps or other heritage properties such as their sister property Rohet Garh. Those who choose to relax in the peaceful surroundings of the hotel may wish to learn how to cook traditional Rajasthani food through a range of culinary demonstrations and workshops. The delicious recipes all come from the books of the late Thakurari Sahbia Javenda Kumari, who was the mother of the owner of Mihir Garh. If even that is too strenuous, there is a beautiful infinity pool in which to laze or indulge in some real pampering at Mihir Garh’s Tulsi Spa, complete with treatments designed specifically to relax and rejuvenate. 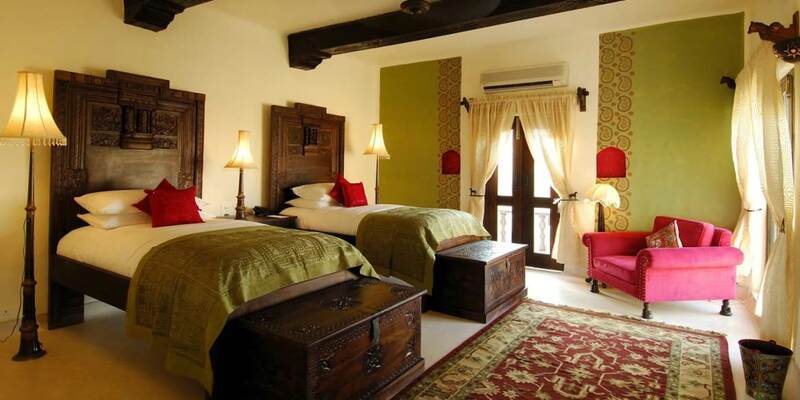 9 magnificent suites offer a haven of relaxation and privacy with each having more than 1700 square feet of space. Everything in the suites has been carefully handpicked and personally designed using the very best materials from furnishings to linens and toiletries. Every chic modern amenity goes hand in hand with tradition. 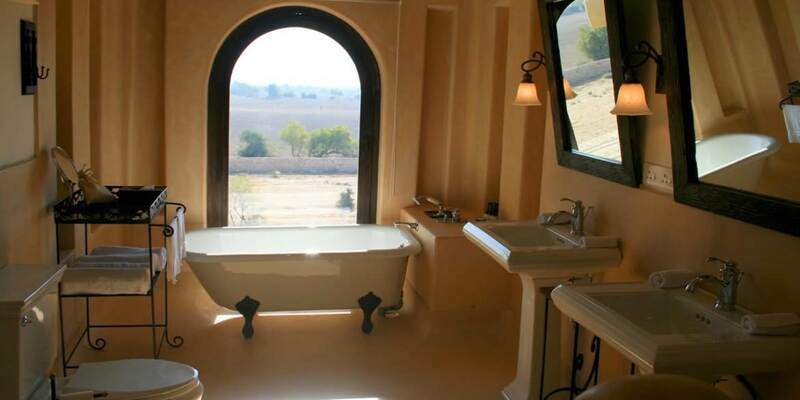 Bathrooms are luxurious, the colours are earthy and muted; floors have been laid using a special plaster technique known only to one man, while fireplaces in the suites have been hand crafted by women from the neighbouring villages. Suites on the first floor are named Shaandar and come complete with an open air Jacuzzi and private terrace, Alishaan is the name given to those on the ground floor, these have the added benefit of their own plunge pool.